From the Wolds in Lincolnshire, the competition heads to the Essex Giro later this month before the Lincoln Grand Prix in May. June sees three races, starting with the CiCLE Classic in Leicestershire, followed by the Curlew Cup in Northumberland and the Otley Grand Prix in West Yorkshire. 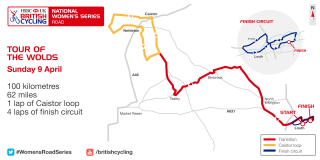 The first weekend of July sees the always popular two-day Alexander Tour of the Reservoir followed by the Newton Longville Festival of Cycling Grand Prix in Buckinghamshire later that month. The series concludes on Sunday 6 August with the Ryedale Grand Prix in North Yorkshire. Individual honours are up for grabs with an overall and under-23 champion to be crowned.